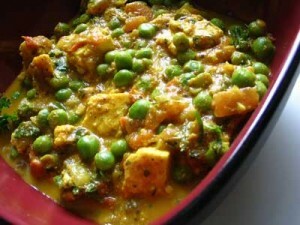 Malai Mutter Paneer recipe by Nazia Nazar at DesiRecipes.com. Grind the ingredients from 6 to 12 in a food processor. In a saucepan,add 3 tbsp of oil and add some cumin. Then add the paste from the food processor. Cook for about 10 minutes till all the water evaporates. Now add the peas,cover and cook for 5 minutes. Meanwhile cut the paneer into 1 inch cubes. Fry the cashews in little ghee . Add cream to the saucepan and cook for 15 minutes. Now add the paneer,cashews,chopped cilantro and salt to it.